The picture doesn’t do it justice. On a cold winter’s evening when the wind chill is dropping the temperature into the middle teens in Central Virginia, what better welcome can you extend than candlelight, polished silver and something delicious cooking in the kitchen? Although we were being entertained in a modest Cape Cod, the dining room felt like one in an English Country House. Lighting, attention to small details and plenty of cocktails are always a winning combination. 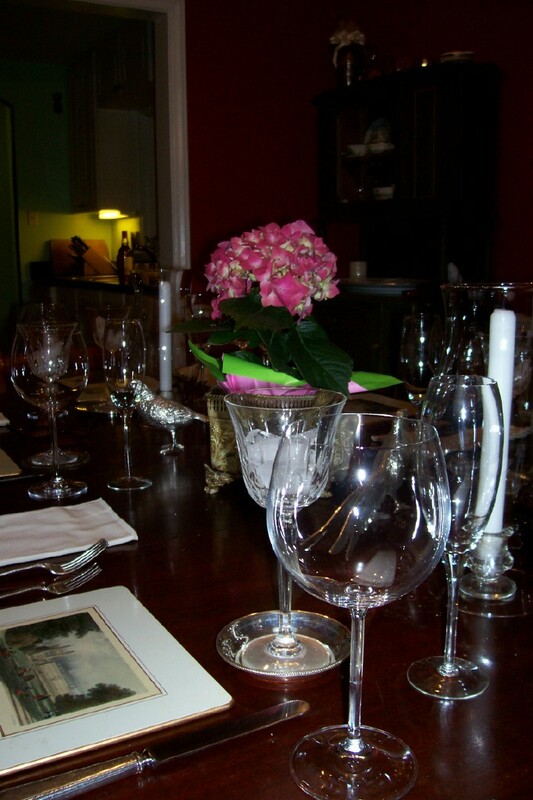 The menu included Chicken Breasts in Morel Sauce (a Barefoot Contessa staple — our hostess swears by her), broccoli cooked with Virginia Ham, fresh baked molten brownies and plenty of pinot noir and champagne. I love the way that our host and hostess dress the table. The key here is creating an old world look with estate silver pheasants purchased at an antique shop, chargers that draw attention to the polished wood of the dining table and wedding silver. It works very well and doesn’t require too much effort. Especially if you use your silver daily, it stays polished longer. But to truly guarantee a successful dinner party all you really need to remember is to put together a group of really fun people. There were six of us for dinner, old friends who still dress for the occasion. This is a group who considers it mandatory to be entertaining when being entertained. The evening included an impromptu rendition of “Mammy” a la Al Jolson (after I accidentally managed to smudge burnt candle wick across my face) and four of us trying to learn a yoga move that had us on our backs with our feet over our heads. Dinner and a show, who could ask for anything more? Broccoli cooked with Virginia Ham. Wine Suggestion: Serve with a Chianti Classico or Pinot Noir.